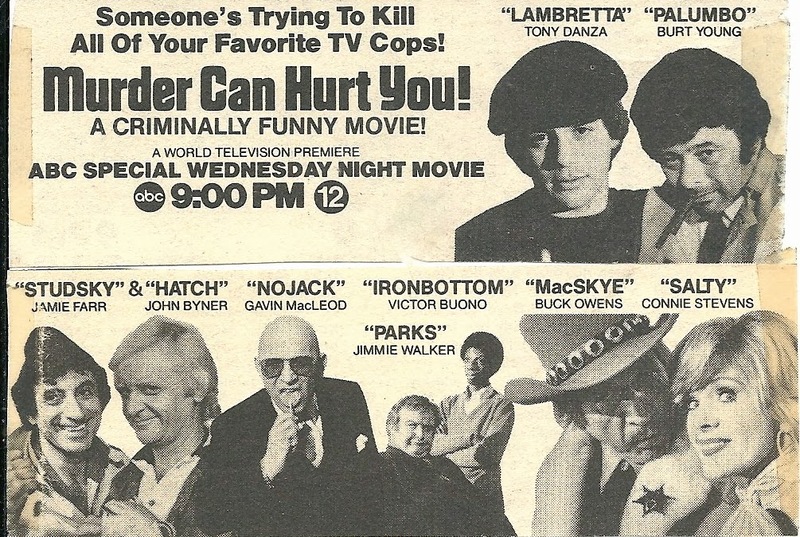 An ad for "Murder Can Hurt You" showing exactly who starred in the movie. You can guess who they were spoofing. The spoof has become a lost art on television. The idea of parodying television shows or movies seems to have been relegated to sketch comedies and late-night talk shows. Back in 1980, ABC and by extension CTV Channel 13 on the peasant vision dial, aired one of the more all-encompassing spoofs. It was a send-up of television crime dramas and spoofed no less than eight different television series. It was more cheese than comedy, but certainly left a lasting impression. It was called “Murder Can Hurt You”, and it featured a who’s who of television actors from the 1970s and 1980s. The plot was simple: someone is murdering all the great detectives and cops, and it is up to the surviving ones to find the murderer and stop him (or her). • “Mrs. Palumbo”, played by Liz Torres, spoofing “Mrs. Columbo”. The narrator was Don Adams, who had played secret agent Maxwell Smart in “Get Smart”, itself a spoof of spy movies. “Murder Can Hurt You” is a TV version of Neil Simon’s 1976 movie “Murder by Death”, which spoofed literary detectives and their theatrical equivalents. I missed the first fifteen minutes or so of this movie, so I never did see the set up. What I found interesting, beyond the mystery of who was really behind all the murders, was trying to identify the characters being spoofed. Some of them did such a good job, it was like they actually were the characters they were parodying. I cannot really think of another example of a parody this broad, and that’s too bad, because “Murder Can Hurt You” and even “Murder by Death”, offer a window to the pop culture of the time they come from. It is out there, in the big wide internet world. An 896MB file.